It is said that a man's best friend is his dog... But for one particular woman, dogs have not only been her best friend, they have also been her saviour. The passion and dedication Crina Alexandra Georgescu has for what she calls her 'furry kids' is commendable. 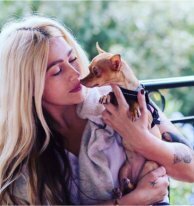 Having struggled with depression, Crina was grateful for one particular dog she rescued who gave her a new focus and helped her to channel her energy in a positive direction. From this point she decided to dedicate her life to rescuing dogs, many dogs and this journey has taken Crina far and wide. When did you rescue your first dog? Crina: "The first dog I rescued was called Negri which I found and re-homed back in 2012." Crina opened her rescue centre in September 2012 and named it Negri's Place - Dog Rescue and is situated in Constanta on the Black Sea coast, Romania. Initially the aim was to try and home the dogs with locals and across Romania but this proved to be very difficult. Romania is a country going through many changes which added to the difficulties placing the dogs in new homes and the people who had a preference for thoroughbred dogs, where not so accomodating when any issues occurred and so a huge percentege, about 75% of the adoptions were unsuccessful. Through research Crina found a way to connect with the UK, France, Germany and Holland and this proved a far more successful route where the people she encountered had a better understanding and higher level of patience when dealing with a rescued dog. This direction opened up a new opportunity to connect with other rescue organisations in other countries, giving access to more vets and trainers. How do you find people to adopt the dogs? Crina: "Most of the adopters are found through facebook which is a very good tool for us. We also receive recomendations from all our adopters which is so very valuable." Once the dog is ready to travel to it's new home, they use a professional pet transport company that travels by road and sometimes Crina will go along too. On occasions their volunteers take the dogs by plane. The team at the rescue centre consists of 3 girls and 1 man all working at the kennels together, supporting each other and doing all the daily cleaning chores, feeding, walking the dogs. Running a rescue centre such as Negri's Place costs a great deal of money. Crina is grateful of the donations received from individual people and through fundraising. Anu and Tommi are a couple from Finland who spend a great deal of time on the Côte d'Azur and are committed to helping Crina and the rescue dogs by fund raising and collecting donations. Others too from Austria, Belgium and the UK all help with funding and collecting food and having it delivered to the rescue centre in Romania. Where did you learn to speak English so well? Crina: "I was taught English at school and with being in regular contact with English speaking people, being able to use it frequently means I am always able to improve it." Crina first visited the Côte d'Azur with her husband who used to live and work in Nice and Menton. She fell in love not only with her husband, but the area and being close by the sea. Crina and Cristian married this August on the beach close to Monaco, surrounded by their closest friends, family and furry kids, of course! It was a pleasure to be the Celebrant at their special wedding and to share in the love they have for each other and to see how many people and dogs are grateful to Crina and Negri's Place. Your wedding day is a special occasion – the day of your dreams! Make your wedding day the most memorable of days. My mission is to create a unique ceremony especially just for you.